The Freshman 15 is real! Okay, not for me (I actually lost some weight this year), but for a lot of people, it is. This has been my first year of eating what I want, when I want, and I've learned a lot. Here are my 7 biggest tips about eating healthy in college. The main dining hall on campus is an all you can eat place. One swipe will get you in the door, and then you can gorge on all the pizza, burgers, and cookies you'd like. This is really bad for portion control. Always eat until your full, but never gorge yourself or try to "eat your money's worth". It'll make you feel disgusting and is never really worth it. When I first get to the dining hall, I either go straight to the salad bar to make a bowl of greens or I go to the hot food section and put some steamed vegetables on my plate. It's a conscious effort on my part because then I know that whatever else I choose to eat, at least something on my plate is good for me. The one exception to this is if I'm getting a stir fry, then I get my load of veggies in my dish. My typical lunch/dinner! 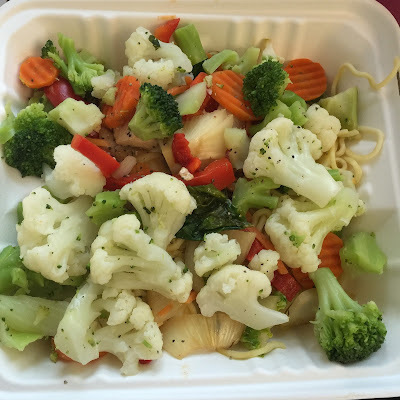 A stir fry with noodles or rice and steamed veggies! This is the most cliche tip ever, but it's really true. I think this semester I've only had pizza once, even though it's always at the dining hall. And when I get a burger (which is maybe once a month max), I order it fresh from the grill and add all the fixins. What I'm saying is that you can eat whatever you want, but if you make the "bad" foods or the fatty foods the majority of your diet, you aren't going to feel your best. When you indulge, make it count! Go big and make sure you finish feeling satisfied. It's really easy to go for the sodas or juice, but those are empty calories. Stay conscious of what your drinking and try to opt for water whenever possible! At my school there's a burger station. It has all the typical ones like hamburgers, cheeseburgers, and turkey burgers, but it also has healthier options like boca burgers and black bean burgers. By swapping the cheeseburger for the black bean one, your saving yourself from fat and cholesterol. Same with the stir fry station! I usually get mine with tofu instead of a protein because I feel better when I eat it, and in my opinion I think that it's healthier. There's always going to be healthy swaps, you just need to look for them! I eat at weird hours, so sometimes I end up eating a lot. There was a time that I used to go to Panda Express at 10 am because otherwise I wouldn't have been able to eat until 3pm. That wasn't my finest moment, but sometimes you gotta do what you gotta do. I am constantly snacking and sometimes I'll get a bagel during a break, then get lunch, then snack in my room, then grab a juice, then eat dinner... It's okay to eat a lot as long as what you're eating is healthy and good for you. It's really not the end of the world if you eat more than the typical 3 meals. I usually end up getting the stir fry because it's made to order and I like being able to choose my vegetables. A lot of the times I'm eating lunch at 1:30 in the afternoon and I'm by myself getting take out, so I end up talking to the people working at that station, cooking my food. That's good for me because then I can ask them to cook it without oil without feeling awkward about it. Sometimes if you want to eat healthy, you need to take control of your situation, and it's always good knowing who's on the other side. These tips are pretty specific for college students on a meal plan, but it could also work for you if you're out eating or just want some tips on how to make some life changes. Let me know in the comments what your healthy eating tips are and if the freshman 15 affected you or not!